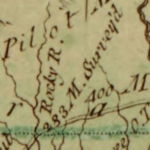 John Mitchell’s monumental 1755 map of North America has a curious annotation in the North Carolina Piedmont. About 15 miles southwest of present-day Salisbury, one sees “283 M. Survey’d”. So what 283 miles were surveyed? 283 mile marker of the Granville Line survey on John Mitchell’s 1755 map of North America.